Home » News » Locals do childhood cancer research proud! Our local supporters never let us down and we’d like to give a special thanks to the lovely Tracey Payton and the kind people of Gatley village for donating £400 to help us fund more vital research into childhood cancer and childhood cancer awareness. The money was raised during Childhood Cancer Awareness month in September by selling gold ribbons and pin badges helping raise awareness for children with cancer. Childhood Cancer Awareness Month (CCAM) takes place every September across the world. It is a month dedicated to raising awareness, support and more visibility for childhood cancer. The colour gold is the recognised colour associated with childhood cancer and Friends of Rosie supports the Glow Gold September campaign every year. Gatley United Reformed Church have also pledged a further donation of £1,000 in support of children’s cancer research and CCAM. 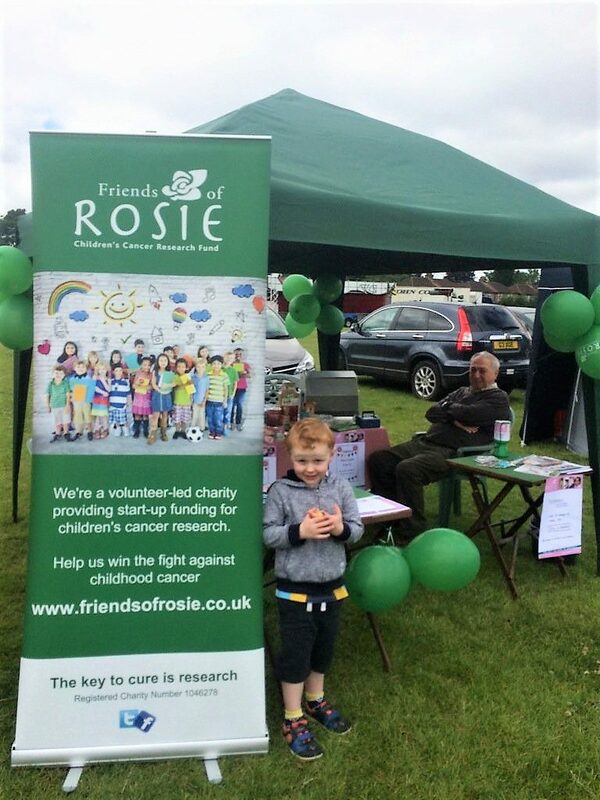 We also had great support at the 2017 Altrincham Festival with lots of people visiting our stall and a tombola that sold out no less than three times!